Dubai is blessed with fine desert sand, being in the midst of the Arabian Desert, whereas other emirates frequently have gravel deserts. And following suit with optimizing landscapes to offer memorable experiences for travelers, you can book your place in one of the modern 4×4 jeep type vehicles for an exciting journey into the luscious sand dunes. It is truly thrilling as the 4×4 is driven in a certain way in order to get your adrenaline pumping! It is a very exciting experience, and safety guaranteed. The tour guide/drivers take an additional 4 people in each vehicle and pick you up from your designated hotel location. Make sure to book in advance to make sure the tours can accommodate your schedule and location. 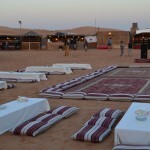 There are numerous tour operators and they all offer a similar experience; overall it is a good 4 hour activity as the safari also includes sunset watching, photo stops and then a traditional and tasty BBQ buffet dinner at a campsite in the middle of the desert. 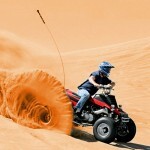 If you are more adventurous and you would like to drive your own ride into the thick desert dunes, you can opt for the alternative to the 4×4 tour, and choose to take a quad bike tour where you can actually drive your own quad. Of course there are various options in terms of vehicles: apart from quads, there are buggies, atv’s. Take your pick! This option requires more energy on your part as you are in control of your quad for the whole duration of the excursion. Here again are various options on operators and types of excursions. Whether it is you want to experience it for a half-day, or for a few hours, enquire and you shall find. Dubai’s innovative architecture has inherently created phenomenal landscaping which can only can fully appreciated if seen from above. 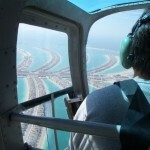 For this reason Dubai prizes itself for offering exclusive, once in a lifetime flight city tours. You can book your private tour through the incomparable Burj Al’ Arab hotel as they have a helicopter landing spot on their roof. Who can resist browsing down from above, watching the exotic coast with its pinkish-tan sands and azure waters? Then the infinite skyscrapers and towers that have been raised, as if from nowhere, into the heights of the sky against a back drop of ancient sandy dunes. And best of all, flying over the Palm marvel as the only true way of seeing it, is from above. It reveals itself so effortlessly, and so magnificent, that it conveys a sense of awe in the viewer. The tallest building in the world boasts an observatory deck that provides for the most amazing views a traveler could ever dream of. Panoramic and breath-taking, there are lounges on the 125th and 148th floors that let you relax and gaze as far as your eye can see. There are several tour options of the Burj Khalifa, from private entry and fine dining, to different floor access, so you can tailor your experience to match your preferences. There are around 55 types of tickets, so find full information here. 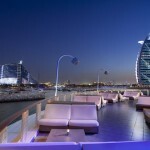 An unmissable night-life must see is the 360° bar that is located in the Jumeirah Beach Hotel. It offers unique views of the area which is proudly displays the and only, Burj Al’ Arab and of course the art deco Jumeirah Beach Hotel. 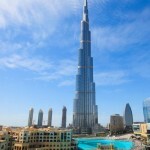 This also exceptional hotel is uniquely designed into a wave which perfectly complements the sail shape of the Burj. Sit back and enjoy your drink taking in the scenery, accompanied by nice tunes and great service. 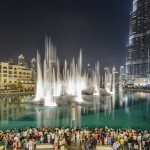 The Dubai Fountain show is something of a spectacle which you can enjoy at The Dubai Mall; designed by the creators of the Bellagio Hotel and Casino fountains in Las Vegas, it sets an exceptional standard for fountains after seeing the grandeur of these. The show combines a visual and musical element, as the fountains are synchronized with musical masterpieces into what can only be characterized as a fluid dance. Water is jetted across the Burj Lake, to up to 140m in height, playfully streaming from five circles and two arcs of fountain points. The greatest advantage is that the lake is surrounded by various excellent restaurants and cafes in which you can enjoy a refreshment or a tasty meal, while watching the show especially in the evening when you can see the Dubai Mall brightly lit in celebration to complement the water stage. This attraction has recently been awarded by TripAdvisor as ‘Certificate of Excellence Winner 2015’ which is an award based on votes of people who have experienced this wonderful show. So, it is truly one of the things you must see while in Dubai, as it is a treat for both the eyes and ears, against a beautiful lake backdrop, and lights all around. Furthermore, if you can’t get enough of the Burj Lake, then boat excursions are available to see the water action from the front row seat! Be sure to check the website for dates and times of the show.